In any industry, top executives are constantly looking for ways to maximize indoor space to suit their requirements. Customizing buildings to suit different industrial needs can be daunting and overwhelming. But not anymore, thanks to industrial steel buildings. These buildings can offer the perfect blend of utility, affordability and customization to suit any trade in the industry. When the term industrial steel building crops up, most people conjure aviation hangars. However, the use of this building has gone beyond this. Here are some of the most popular trades that use industrial steel buildings. With globalization, logistics and warehousing are taking a new turn altogether. Businesses are growing at an alarming rate and this has necessitated the need to have additional space to absorb the growth without spending too much money. While the trend used to be to lease a location for logistics and warehousing, in the long-run this is too expensive. So, warehousing and logistics companies are turning to industrial steel warehouses that also double up as offices for their personnel. As consumer demand for manufactured goods is increasing, manufacturing units are growing in size. 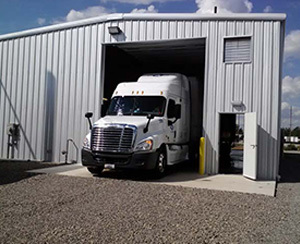 Industrial steel buildings fit the needs and requirements of manufacturing units, as they can be customized, insulated to make them energy efficient and available in wide ranging sizes. Setting up a pre-fabricated steel building for manufacturing purposes is simple, cost effective and quick. And, the floor plan can be changed with ease without adding to the structure or spending large sums of money. A dry dock is a place where ships are towed in and repaired. The climate in Canada often demands ships be protected while they are being repaired. Making such a huge structure from wood can be cost prohibitive. Hence, an industrial steel building is the best option for dry docks whether they are repairing and overhauling fishing boats, oil tankers or large luxury cruise liners. Not only are such buildings cost effective, they can easily be erected to cover large ships and still leave ample space around the structure for easy movement and repairs. In North America, a lot of produce and goods are sent by road using trucks. A truck terminal is a necessity where goods are stored, consolidated, collected and sorted for outward transportation. Industrial steel buildings can easily be used as truck terminals. These buildings can be climate controlled to ensure perishable goods are preserved for further transportation. Also, they offer a secure storage, collection and sorting space until goods are sent out on different carriers. Above all, it is extremely affordable to set up pre-fabricated steel buildings to use as truck terminals. Heavy equipment is expensive and due to its very nature and use, there is a regular need to maintain it. This type of equipment needs optimal protection and adequate space to accommodate the large size. It can be expensive to set up a facility using traditional construction materials, but this worry is not there in case an industrial steel building is used.